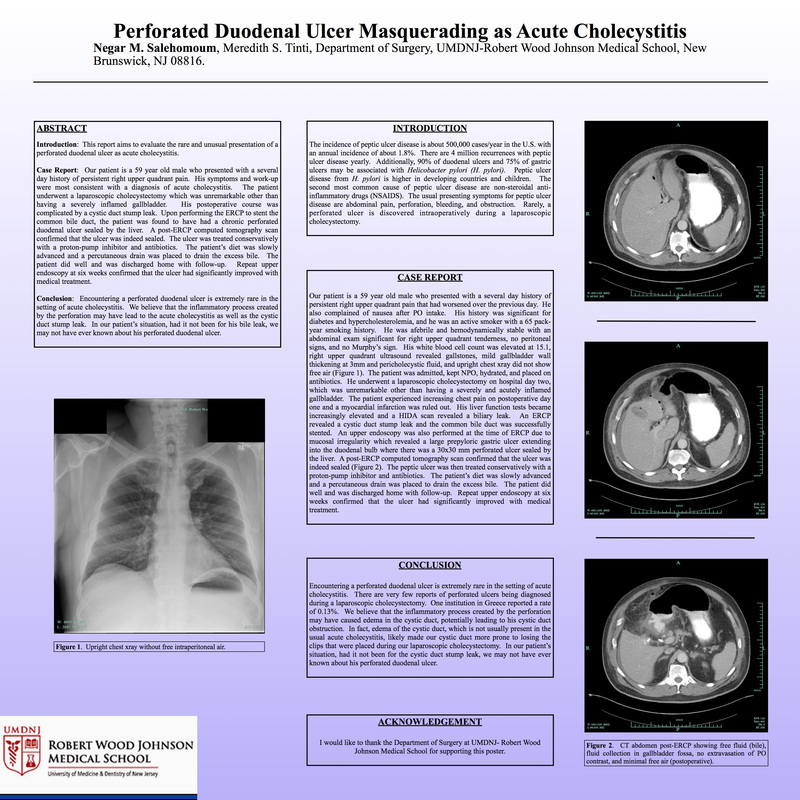 Introduction: This report aims to evaluate the rare and unusual presentation of a perforated duodenal ulcer as acute cholecystitis. Methods and Procedures: Our patient is a 59 year old male who presented with a several day history of persistent right upper quadrant pain as well as other symptoms consistent with acute cholecystitis. His workup revealed an elevated white blood cell count, gallstones, gallbladder wall thickening and pericholecystic fluid on his right upper quadrant ultrasound, and an upright chest xray without free air. The patient underwent a laparoscopic cholecystectomy on hospital day two which was unremarkable other than having a severely inflamed gallbladder. Postoperatively, the patient began having increasing pain and a HIDA scan revealed a biliary leak. An ERCP revealed a cystic duct stump leak and the common bile duct was successfully stented. An upper endoscopy was also performed at the time of ERCP and revealed a large prepyloric gastric ulcer extending into the duodenal bulb where there was a 30×30 mm perforated ulcer sealed by the liver. A post-ERCP computed tomography scan confirmed that the ulcer was indeed sealed. The peptic ulcer was then treated conservatively with a proton-pump inhibitor and antibiotics. The patient’s diet was slowly advanced and a percutaneous drain was placed to drain the excess bile. The patient did well and was discharged home with follow-up. Repeat upper endoscopy at six weeks confirmed that the ulcer had significantly improved with medical treatment. Conclusions: Encountering a perforated duodenal ulcer is extremely rare in the setting of acute cholecystitis. There are very few reports of perforated ulcers being diagnosed during a laparoscopic cholecystectomy. One institution in Greece reported a rate of 0.13%. We believe that the inflammatory process created by the perforation may have caused edema in the cystic duct which led to cystic duct obstruction and acute cholecystitis. In fact, edema of the cystic duct, which is not usually present in the usual acute cholecystitis, likely made our cystic duct more prone to losing the clips that were placed during our laparoscopic cholecystectomy. In our patient’s situation, had it not been for the cystic duct stump leak, we may not have ever known about his perforated duodenal ulcer.